We spent a few days in Tiberias last week, on the shore of the Kinneret. It’s only forty minutes or so from our home, but at 200 meters below sea level, it was significantly warmer than Tzfat. 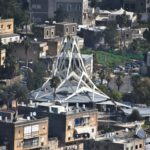 While Tzfat is famous for the great kabbalists and tzaddikim who lived here from the sixteenth century on and are buried here, Tiveria has its own distinguished history. In 270 C.E. the Sanhedrin moved to Tiveria, and through the centuries some of the greatest scholars of all time lived there or are buried there: Rabban Yochanan ben Zakkai, Rabbi Eliezer ben Hyrcanus, Rabbi Meir, Rabbi Akiva and his wife Rachel, Rabbi Hiyya, Rabbi Yochanan, Rabbi Ami and Rabbi Asi, Maimonides, Rabbi Isaiah Horowitz, Rabbi Menachem Mendel of Vitebsk, to name a few. So we engaged in some spiritual tourism, visiting the gravesites of some of these great Torah luminaries. 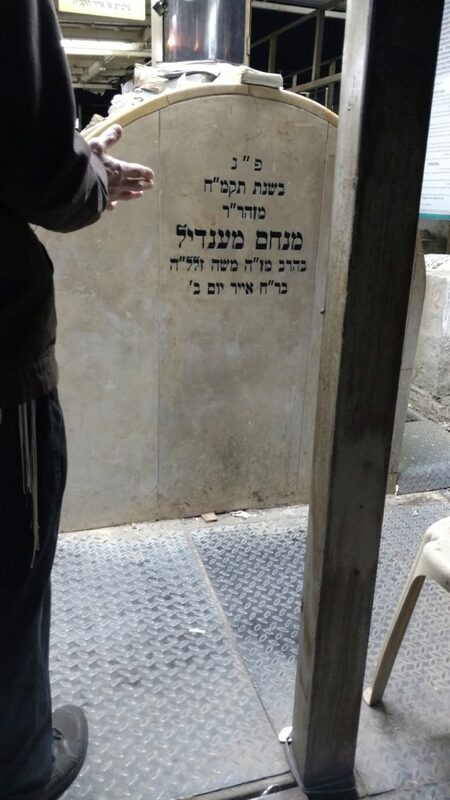 I’ve discussed in a previous post the kabbalistic approach to visiting the final resting place of a Tzaddik. To summarize briefly, we visit to connect our consciousness to their abiding consciousness, to continue to learn with them directly. It’s especially helpful to be learning their Torah insights beforehand. Rabbi Shimon bar Yochai says that “for all Torah scholars, when people quote a teaching in their name in this world, their lips murmur in the grave, as it says ‘your mouth is like good wine that goes straight to my beloved, murmuring the sleepers’ lips (Song of Songs 7:10; Yevamot 97a).” They were great teachers in their lifetimes, and teachers love nothing more than to continue teaching, even from the next world. When we read the words of another person in a text, we are immersed in traces of their mind and this helps us connect to their present consciousness. When we study the wisdom of Rabbi Akiva in the Gemara, for instance, we enter his mind to some extent. But this experience tends to remain abstract. At his gravesite we have the direct awareness and poignant feeling that this great man, and his great wife Rachel, really lived, and their consciousness continues and we can really connect to them. 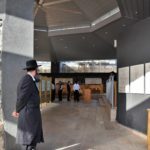 As we visited several of these great tzaddikim, we were saddened by the changes that have occurred to their resting places. It used to be that when you visited Maimonides, for instance, men and women could gather easily around his grave. Now an elaborate mechitzah, a high divider, has been erected separating a men’s section from a women’s section. We remember that around fifteen years ago we were visiting Maimonides’ gravesite on a warm February evening and happened to meet a leadership group of men and women we knew from the Combined Jewish Philanthropies of Boston, who were visiting at the same time. One of the members of the group was saying the last kaddish of the year of mourning for his father that day. 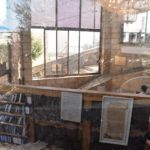 So we all gathered around a table right next to Maimonides, men and women together, and I gave an impromptu shiur in memory of the departed soul on the sanctity of the Land of Israel according to the halakhot of Maimonides in his Mishneh Torah. It was a magical and poignant moment, joining souls in this world with souls in the next through Torah. It would be hard to do such a thing today. Two years ago, we went with another couple, good friends, to visit the grave of Rabbi Eleazar ben Arakh, great student of Rabban Yochanan ben Zakkai, in the village of Alma, a little north of Tzfat. 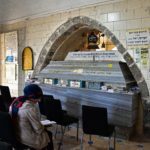 There are no partitions disturbing this holy place – just the tomb of Rabbi Eleazar and some tables and benches. We sat together learning his Torah and we all felt the Tzaddik’s inspiration in our learning, opening our hearts to profound understanding – a powerful experience. This separating of genders has crept up at many of the more popular gravesites that were formerly more casual and open to all to gather ‘round. This has also happened in Tzfat. 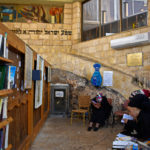 Usually, some effort is made to assure that, even with the partition, women have as much access as men – in some places the mechitzah will split the Tzaddik’s grave down the middle, half for the women, half for the men. 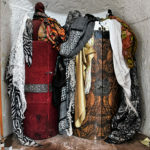 But we were disturbed to find that at Rabbi Akiva’s gravesite, not only did someone hang a garish chandelier in the room, but women were not permitted near him at all – they are fenced off at a distance. In his life and teachings Rabbi Akiva stood for sensitivity and care for others. 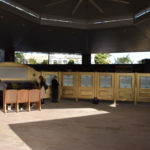 His wife Rachel’s gravesite is also partitioned, but, as if in some kind of compensation, there is an Aron Kodesh with a Sefer Torah – only on the women’s side! 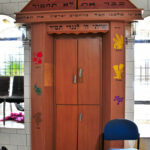 Yes, this Aron Kodesh in in the women’s side! Those men who are obsessed with gender separation do not want to be confronted with the image of a woman, real or pictorial, for fear it will arouse desire, which they consider the main threat of the “yetzer ha-ra – the evil inclination.” But rather than take responsibility for themselves and learn to control their own eyes and their own desires, they feel entitled to impose restrictions and inconveniences on others so women will be kept far from them. On public buses that serve some neighborhoods in Israel, women are expected to sit in the back of the bus (for Americans this conjures up distasteful associations). Such irresponsibility and such hysteria over gender is not the true path of Torah. There are four head categories of damages: the ox, the pit, the consuming animal and the igniting fire. The ox is not like the consuming animal and the consuming animal is not like the ox. And both of these, that have the spirit of life, are not like the fire that does not have the spirit of life. And all these, whose way is to go forth and do damage, are not like the pit, that does not go forth and do damage. The common denominator of them all is that they tend to do damage and the responsibility for guarding them is upon you, and if they do damage, the owner of the damaging entity is obligated to pay compensation for damages from the best of his land. This Mishnah lays out four categories that cover the range of damages that can be due to one’s property. One line of interpretation in the Gemara is that the ox stands for animals that damage by the way they move, such as an animal that tramples the property of a neighbor. The consuming animal refers to those that are drawn to do damage by natural desires, such as an animal that eats the crops of a neighbor’s field. The fire stands for inanimate property that does active damage, and the pit to inanimate property that does harm without moving. The common principle of them all is that since these kinds of property tend to do damage, we are responsible for guarding them effectively. Our obligation to keep ourselves or our property from doing harm cannot be imposed on others or on the public — it’s our responsibility to control ourselves and our property. Rabbi Mordechai Leiner in his commentary Mei HaShiloach explains that the Torah here is teaching us how far our responsibility in this world extends. We are completely responsible for ourselves and our property, extensions of ourselves, and the process of purifying and sanctifying ourselves in self control helps us be vigilant and spiritually attuned so that our property will not cause harm to others. Emmanuel Levinas understands the Torah to go even further, awakening us to our endless responsibility in this world. As each of us looks out upon the world around us from our embodied location, we are each responsible for the entire field of existence before us and all the beings in it, and responsible to conduct ourselves with self-control and sensitivity to others. Responsibility is the essential, a priori human condition, the quality through which we emulate God in Whose image we are created, and this is the very essence of Torah and its exposition by the great Rabbis of all generations (Nine Talmudic Readings).